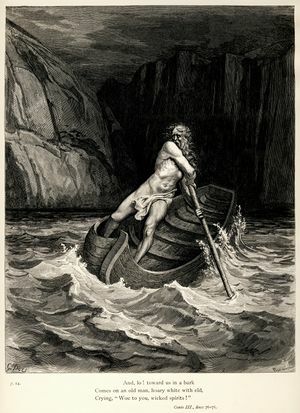 Charon coming to ferry souls to Hell, in Canto 10 of The Divine Comedy. The engraving is by Doré. Jacob ben Machir is appointed dean of the medical school at Montpellier, France. Aztec culture starts in Mesoamerica (approximate date). The Dulcinian sect begins when Gherardo Segarelli, founder of the Apostolic Brethren, is burned at the stake in Parma, during a brutal repression of the Apostolics. عالم الدين الدمشقي المسلم شهاب الدين أحمد بن فضل الله العمري. March 25 (April 2 in the Proleptic Gregorian calendar, Good Friday) – The date of Dante's journey as the protagonist in his own epic poem, The Divine Comedy. Beginning with the Inferno, he made many cultural references to his time. Till Eulenspiegel is said to have been born in this year.